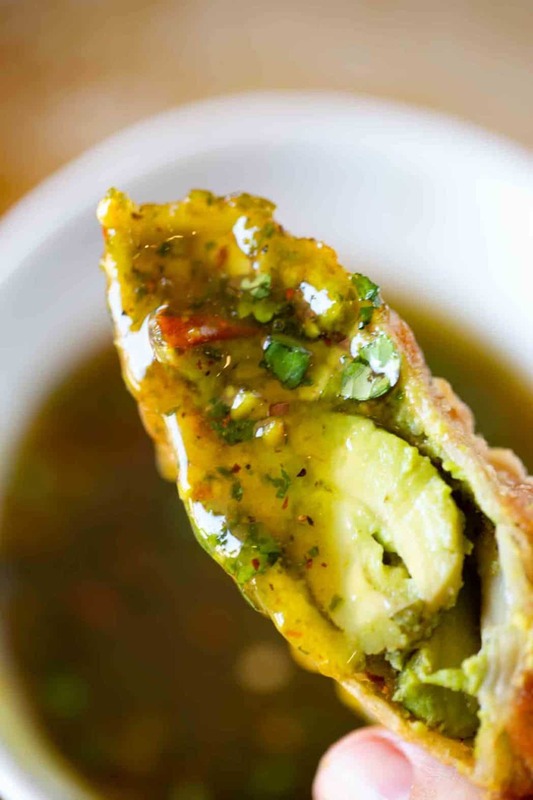 Cheesecake Factory Avocado Egg Rolls are the perfect fresh avocado and sun dried tomato filled egg rolls with a bright cashew tamarind cilantro dipping sauce you love in the restaurant! 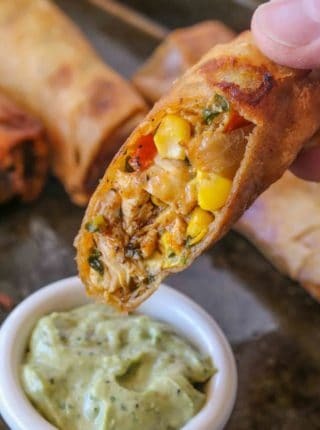 If you love these egg rolls you’ll love the Cheesecake Factory Tex Mex Egg Rolls too along with Buffalo Wings in making your perfect appetizer spread! Cheesecake Factory copycat recipes are the most popular copycat recipes on the site! Yes, even more than Panda Express recipes, and we love the appetizer menu the most because it is where they release the most new recipes. These creamy avocado egg rolls seem like they’d be hard to make but they only have five ingredients in the egg roll recipe! The avocado filling is just avocados, sun dried tomatoes, onions and cilantro with a bit of pepper, so most of the pops of flavor come from the sauce ingredients. 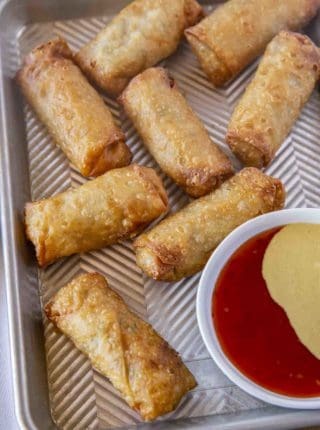 The cook time of the recipe is just a few minutes too because the egg rolls just need to be fried long enough to brown. If you want a quick and easy sauce option without as many ingredients you can use a sweet chili sauce with some fresh cilanto and a bit of vinegar mixed in and save yourself the trip the grocery store looking for tamarind pulp. Fill with 2-3 tablespoons of avocado filling in a horizontal line. Wet the edges of the wrapper. Fold the sides in over the filling. Fold down the top corner and roll down tightly towards the bottom corner. Let sit for 10 minutes before frying to allow wrapper to seal before frying on medium high heat. Just know if you bake them the avocado won’t be as bright green inside because of the longer cooking time. 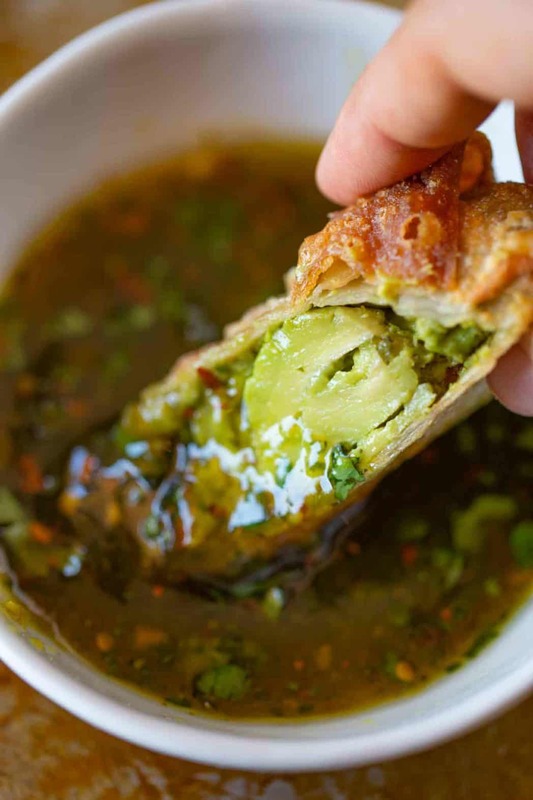 Avocado Egg Rolls are easy to make and since your filling is meant to be eaten raw. You only have to fry them long enough to cook the egg roll wrappers to a perfect golden brown. Do not freeze these egg rolls, frozen avocado that is defrosted does not reheat well. 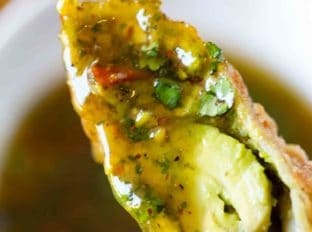 If you aren’t cooking immediately toss the avocado mixture in lime juice. 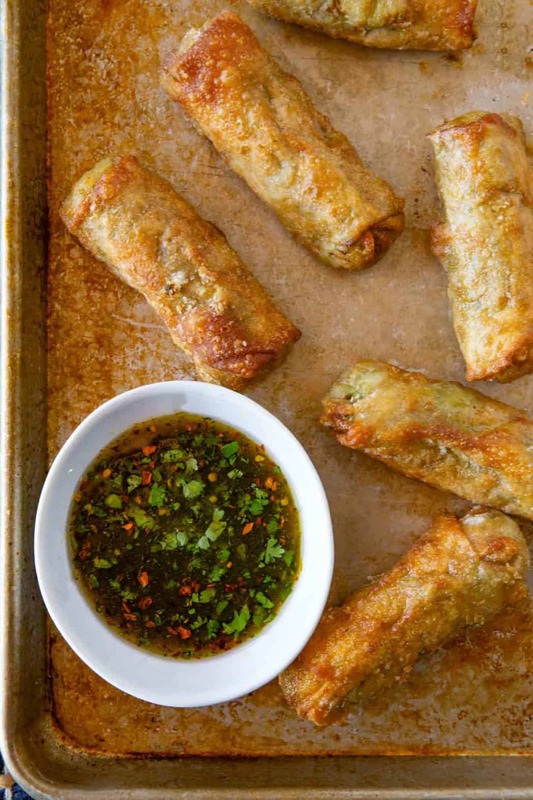 Add some heat to these egg rolls with some chopped spicy chili pepper, a dash of cayenne pepper, or red pepper flakes. Serve these with other appetizers like P.F. Chang’s Chicken Lettuce Wraps (Copycat) orKorean Ground Beef Egg Rolls. Place these egg rolls on a cooling rack with paper towels under it to catch any hot oil that drips off. Putting them directly onto the paper towels may cause the bottoms to steam and get soggy. If you want to avoid using eggs, use a bit of water on the edges of the wrapper to seal it and prevent them from opening while deep-frying. If you want to make these into small bites fill them in wonton wrappers with just 1 tablespoon of filling. Add ingredients together in a small food processor and pulse until combined, in small pieces but not smooth. 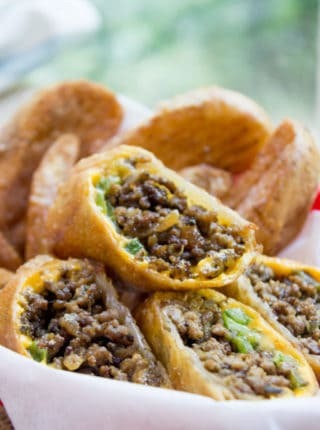 If you look at the Tex Mex Egg rolls there is a second dipping sauce, a sour cream cilantro dipping sauce. Combine the avocados, sun-dried tomatoes, red onions, cilantro and salt in large bowl and lay out your egg roll wrappers on a tray. 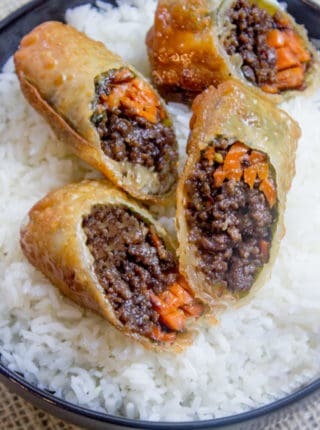 Brush the edges of the egg roll wrappers with the egg and fill with 3 tablespoons of filling each, then fold in the sides of the wrapper and roll closed, make sure there isn't extra air in the egg rolls as you wrap. Heat three inches of oil in a dutch oven to 375 degrees then fry the egg rolls for 3-4 minutes until golden brown then let cool on a metal cooling rack and serve with dipping sauce (recipe above). I love a good copycat recipe! Can’t wait to try it! Oh my goodness these were amazing! Thank you so much! This is one of my favorite appetizers to order when I eat out! Love that I now know how to make it at home instead! So much more budget friendly, for sure. OMG these turned out amazing!!! So tasty. These taste just like the ones from the factory! So happy I can now make them at home. Where is the dipping sauce? Is there a recipe? The recipe for the dipping sauce is in the post above the recipe card. Enjoy! 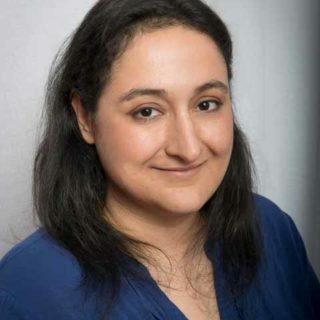 I just want to say Sabrina, from the bottom of my heart, thank you for your recipes. They are always the best! I’ve been cooking for 60 yrs and you and martha stewart are my go to girls. I don’t bother with all the others. I just google you and martha because I know from experience I’ll get a recipe that’s perfect. That is so sweet of you to say, Karen. Thank you so much.